Painting, decorating and raised access flooring are three of our most in-demand services. Read below to learn more! Whether latex, oil, acrylic or other forms, painting and decorating is one of Carlson's signature Commercial Services. From fresh paint jobs to touch-ups and repairs to existing projects, Carlson Commercial and Industrial Services can expertly provide your building with a custom paint job that will beautify your space. From intricate touch-ups to professional work on corners and edges, our painting and decorating projects are done right the first time so your business goes through as little interruption as possible. Remember - no job is too big for Carlson Commercial and Industrial Services. We have provided a wide variety of Winnipeg businesses with our painting services and the results speak for themselves. Whether renovating a century-old heritage building or building a new, modern facility in one of the industrial parks that dot suburban communities, raised access flooring from Carlson Commercial Servicers can be the solution to your logistical concerns. What is Raised Access Flooring (aka computer flooring)? What are the advantages in using raised access flooring? Raised access floor systems are often designed to include equipment designed to handle heating and physical loading, creating capital and operational cost savings. 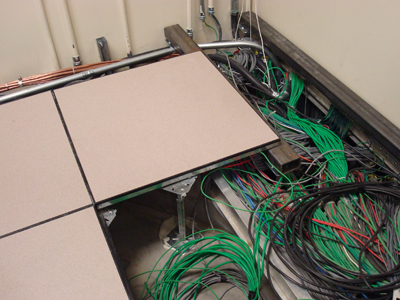 Raised access floor system floor panels are modular and readily removable to allow quick access to under floor HVAC equipment, power/data/voice cabling, etc. Work station and electrical equipment foot prints and configurations can be modified easily with little fabric cost. Raised access floor systems are LEED point compliant. Virtually any architectural floor finish can be easily applied to raised access flooring. Where is Raised Access Flooring Used? Regardless of the age of your building (or whether it is still being constructed), Carlson’s team of professionals can provide you with the manpower and knowledge to supply you with the best raised access flooring product, design, planning and installation. To learn more about Carlson's painting and decorating services, click here to contact us.